This example shows a gas flow in a duct which has rectangular X-Y sections. The shape is symmetrical with respect to X-Z plane. 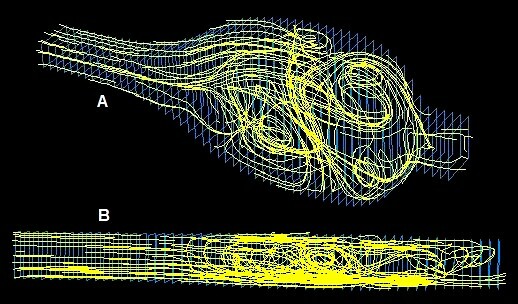 The simulation shows that the symmetry of the duct and of the boundary conditions does not results in symmetrical flow. Note that the symmetrical solutions may exist in such cases, but they have merely academic value. Many simple CFD programs show such solutions, that does not mean that the software is bad. Simply such solutions are unstable and the real flow becomes asymmetrical after certain time. This, of course, needs dynamical, time-dependent solutions and several hours of computer time. The left- and right-hand sides of the duct are open. The air flow is forced by the fixed pressure of 100 Pa, applied to the inlet (leftmost) layer. The following figure shows the flow evolution over the time interval of 0.1 secons. The flow lines for T=0.1 are shown below. Part B is the upper view. Note that this is 3D simulation. One might expect that the flow lines should be parallel to the Y-Z plane, and that the problem can be simulated as a 2D flow. This, however is a wrong asuumption. The flow lines take complicated 3D shapes, and 2D simulation can only provide wrong and confusing results.